And now, a few words of instruction from Brother Brigham on the subject of the evil spirits in the world around us. The occasion was the funeral of President Jedediah M. Grant on December 4, 1856. The Source is the Journal of Discourses, vol 4, pp. 129-134. "…when I die…I do not wish any of you to cry and feel badly, but prepare yourselves to fight the devils while you live, and after you pass through the veil...there we will do a great deal more than we can here. 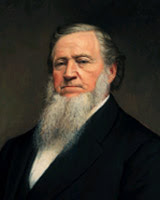 "Brother Grant can now do ten times more than if he was in the flesh...He is in the spirit world. He has conquered death and hell...He is no more subject to the devils...he commands them, and they must go at his bidding; he can move them just as I can move my hand. "When men overcome...they have power over all disembodied evil spirits...Those evil spirits are under the command and control of every man that has had the Priesthood on him, and has honored it in the flesh, just as much as my hand is under my control. "Do you not think that brother Jedediah can do more good than he could here? When he was here the devils had power over his flesh, he warred with them and fought them, and said that they were around him by millions, and he fought them until he overcame them. "The spirits that afflict us and plant disease in our bodies, pain in the system, and finally death, have control over us so far as the flesh is concerned. But when the spirit is unlocked from the body it is free from the power of death and Satan; and when that body comes up again, it also, with the spirit, will gain the victory over death, hell, and the grave. "When the spirit leaves the tabernacle of flesh and goes into the spirit world, it has control over every evil influence with which it comes in contact, and when it takes up the body again, then the body also, with the spirit, will have control over every evil spirit that is in a tabernacle, if there is any such being, just as far as the spirit that has the Priesthood had control over evil spirits. "Perhaps you do not understand me. Take a spirit that has gone into the spirit world, does it have control over corruptible bodies? No. It can only act in the capacity of a spirit. As to the devils inhabiting these earthly bodies, it cannot control them, it only controls spirits. "But when the spirit is again united to the body, that spirit and body unitedly have control over the evil bodies, those controlled by the devil and given over to the devils, if there is any such thing. Resurrected beings have control over matter as well as spirit. "We are surrounded with more evil spirits than good ones… The spirits of the just and unjust are here. The spirits that were cast out of heaven, which you know are recorded to have been one-third part, were thrust down to this earth, and have been here all the time, with Lucifer, the Son of the Morning, at their head. "You and I have yet to deal with evil spirits, but Jedediah has control over them. When we have done with the flesh, and have departed to the spirit world, you will find that we are independent of those evil spirits. But while you are in the flesh you will suffer by them, and cannot control them, only by your faith in the name of Jesus Christ and by the keys of the eternal Priesthood. "Where do you suppose the spirits of our departed friends are? Where they ought to be; they are here…they are controlling the fallen spirits here, or somewhere else. They could not control the spirits of evil men while here, only by faith, but now one of our departed brethren can control millions of disembodied evil spirits; while they were in the flesh they were afflicted by them." The early leaders of the church spoke plainly and frankly about the influence of the evil spirits upon us. I do not find that we speak as much about this doctrine any more. We are warned against the influence of the adversary in general. Has this belief or teaching about the power of the evil spirits fallen out of favor? Are we too concerned that the world will ridicule our belief? I also learned that we have power over evil spirits, both through faith and through the authority of the priesthood. In Brigham's remarks I learned that the evil spirits can inhabit mortal men but that they do not control their bodies, only their spirits. The devils have control or power over our bodies only to afflict and torment us with disease, sickness and temptation. It is also evident that the spirits of the departed are all around us. We are more likely to encounter the influence of wicked spirits as the righteous are busily engaged in good works. It is the wicked disembodied spirits who hang around that cause trouble by attempting to take possession of mortal tabernacles, even if for only a few moments, overpowering our own spirits.